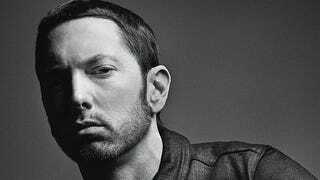 It requires some serious suspension of disbelief to buy that Eminem is an underdog at this point, considering that his last album is both quadruple platinum and the winner of the Best Rap Album Grammy. But saying, “Everybody hates me” and, more specifically, “Guess who’s back?” has served his career well so far, and the narrative continues on the just-released, kinda awful Beyoncé-enhanced single “Walk On Water.” The world agrees that Beyoncé is a magical angel, with equal parts badassery and pure talent, but even she can’t save this one. As ever, though, once Eminem has built himself an imaginary enemy—lower record sales? people who don’t like his hair?—he fights back, letting us know that he will decide when his career is over, not you, invisible beast who stops careers. There is also the sound of what I think is supposed to be ice cracking under Em’s feet, because of that chorus about walking on ice, because he is not Jesus.